As you might have notice I do have a penchant for shoes. I buy them more than I buy other fashion items. My boyfriend keeps pointing out that I only have a pair of feet what do I need loads of shoes for?!?! I keep telling him that a girl can never have too many shoes. Am I right? It's the little Imelda Marcos in all of us. Hahaha! Oh my god, you lucky lady! All of those shoes are fantastic, especially the moccasin booties and the cut out oxfords. And a girl can NEVER have too many pairs of shoes. great taste in shoes lloyda! i absolutely love everything. those tan ankle booties are just mesmerizing me right now. Wendy: Yeah lucky indeed. I love it when I go shopping with the mothership. She pays for everything! Mej: Thank you. 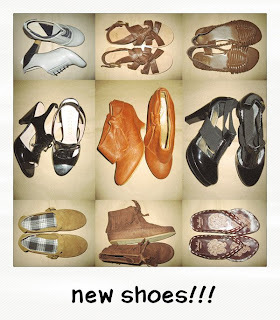 I simply love shoes!! !